learning all summer long. 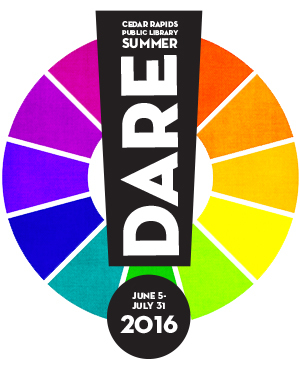 The 2016 Summer Dare is not your average summer reading program. It is an intergenerational summer learning program that challenges the entire community to read it, picture it, move it, celebrate it, explore it, imagine it, make it, and wing it! The CRPL Summer Dare Kick-Off Party will be held at the Ladd Library on Sunday, June 5, from 1 pm to 4 pm. Everyone is invited to attend and get registered for the Summer Dare, participate in activities, including a bouncy house, face painting, balloon animals, and enjoy free ice cream! We encourage participants to share their progress with us on social media using the hashtags #2016summerdare and #notyouraveragelibrary.